The decision is taken to close the Gateway—but for unknown reasons, this proves impossible. This means that creatures from the side continue to be able to cross over into the humans’ world, an occurrence known as an Incursion. A Citadel is built around the Gateway and a protective force known as the Company of Tectors is established to kill the creatures as quickly as possible when an Incursion happens, and, when necessary, foray through the Gateway to take the battle to the enemy. Expeditions into the other world are not to be undertaken lightly, for no-one has ever come back to tell the tale. Those left behind can only assume that their comrades who have passed through the Gateway have perished at the hands of the alien creatures. As The Empty Throne begins, we are introduced to Dhanay Monselin, a recruit who has completed the training required to join the Company of Tectors. The first few chapters follow Dhanay’s adventures as he undergoes the final testing before being formally admitted to the Company. When Dhanay successfully overcomes the various trials laid before him, including a set of scenarios designed to test his commitment, it’s cause for celebration. But the joy is short-lived when Dhanay’s first night on guard ends with an Incursion from the other world. As the first one to notice the Incursion, it falls to Dhanay, despite his youth and relative inexperience, to become Custos and lead an expedition through the Gateway to take the battle to the interlopers. He does so with the grim knowledge that he is unlikely to survive the effort. But when Dhanay gets to the other side of the Gateway, he’s in for a series of surprises. As it turns out, the companies who preceded him are not, in fact, all dead. Though some individuals have died at the hands of the enemy, others have survived. The reason the remainder haven’t returned to Dhanay’s world is that the Gateway won’t let them through. The other surprise is that time passes far more slowly in the world of the rajuk and kulun than it does on the other side of the Gateway. As a result, Dhanay finds himself face-to-face with figures from his culture’s history. It’s said that the definition of insanity is doing the same thing over and over and expecting a different outcome. Dhanay realizes that they need to find an alternative to the way they are approaching the conflict. He comes up with a risky but promising idea for opening discussions with the aliens, to find out whether common ground is possible. His challenge will be to win over his colleagues, some of whom have become entrenched in the current way of doing things. While Dhanay is trying to find the best way forward, the people he left behind on the other side of the Gateway have their own problems. The social structure depicted in Allan’s novel includes Inceps, or provincial leaders, who are governed by a Tenan. After we are introduced to Dhanay and see him off on his adventures, the novel shifts focus to Dhanay’s cousin Petowyn, who is the son of Hanir Tackibu, Incep of Kyasu. As a result of a horseback riding incident Petowyn suffered when he was a child, Petowyn’s father has been protective of him. Because he has been shielded from danger, Petowyn is considered by some to be a coward. This reputation presents a stumbling block to his father’s desire to name him as his heir. To clear his name, Petowyn agrees to enlist in the Tenan’s Guard. Because of his excellent grounding in swordsmanship, he is able to win the respect of his peers and instructors before leaving the Guard to take on responsibilities related to his home province. While there is some jostling and posturing between the Inceps, by and large the world is relatively peaceful. We get the sense that’s about to change when we meet a third key player in the novel, Anelm Bospheon, an opportunistic Baryn who himself is a former Tector. When one of the kulun that has passed through the portal tries to possess Anelm, he finds he is able to resist possession and in turn control the kulun. This gives him the idea of using the kulun and a couple of its fellows to stir up trouble in the realm, with the goal of helping Anelm advance his own ambitions. Anelm’s job is made easier by the fact that he can leverage already-existing friction between various provinces and ethnicities. Throughout the novel, Allan uses third person viewpoint to take us back and forth between Dhanay, Petowyn, Anelm, and other characters, showing us the events as they unfold. There are usually multiple scenes within each chapter. Some of these scenes are quite short—a couple of paragraphs in one case, a single page in another. The novel is set in a medieval society with some magical elements. Travel is by horseback or barge, fighting involves swords or magical craftings, and candles and torches provide the light sources. Though Allan empowers the Mesters, who specialize in craftings of wood, stone, or metal, with magician-like powers, the antagonistic creatures are not the common fantasy story stand-bys of elves, dwarves, giants, and the like. Instead, Allan introduces the rajuk, paher, and kulun. As a reader, I appreciated the effort at originality. At the same time, I had a more difficult time envisioning the creatures and the fight scenes than I might have on the case of a more corporeal entity. That being said, Allen’s world-building is one of the novel’s strengths. 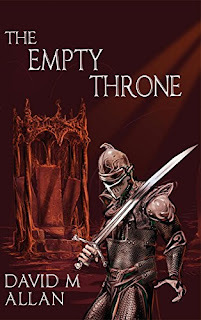 The Empty Throne has its own time system, of “candle marks” or more simply “marks”. The method of detecting, and dealing with, the Incursions through the Gateway is also interesting. Though we don’t get too far into the details, it’s also clear there are different schools of belief, “Derivationists” and “Originists” (38). Each chapter is introduced with snippets of “history”, which deepens the sense of authenticity. Urgent messages are sent using a message dart, a method that includes use of magic. Allan creates his own political structure, provinces, etc. He provides a territorial map and a list of the main players at the start of the book, showing that there’s a degree of thought behind the story. The society Allan creates is egalitarian in that both males and females serve as Mesters and Inceps. One of the interesting sub-themes of the novel is how easy it is to stir up animosity between people of different cultures when prejudices and stereotypes exist. Part of the reason Anelm’s schemes get as far as they do is the underlying ill-will between people of different ethnic backgrounds. For example, Luusengers are referred to as “pig-faces”, partly because a boar is their emblem or symbol, but also as an insult. When the kulun spread dissent and rumors, people build upon these, so that the stories start to run far worse than the original, much to Anelm’s delight. This is a believable, if chilling, aspect of the story. The first half of the novel builds a good foundation for conflict, with all the pieces in position and Anelm positioned behind the scenes ready to use the kulun to stir up trouble. I had a strong interest in seeing how events would unfold. But once Anelm started his machinations, I felt that the plot line hit a plateau. It’s not that nothing happened. Lots of things occurred—battles, conflicts, spats, killings. However, I would have preferred either a clearer escalation of events building to the story’s climax, or a condensing of the events of the second half so we get to the crux of things more quickly. 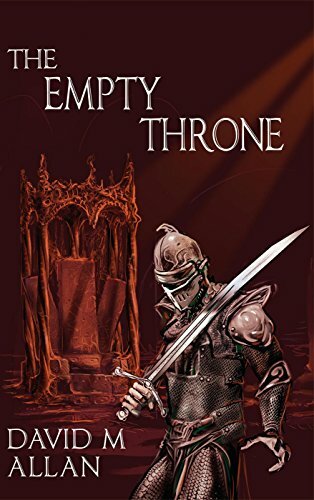 That being said, there is a lot to like about The Empty Throne. Allan provides us with a gateway into an original world with its own political structure, magical systems, and beliefs. The story provides swordplay and plenty of conflict, with likeable protagonists to root for. There is a satisfying ending that ties up loose ends. And perhaps most importantly, there’s an underlying message about the perils of prejudice that rings true in any world.